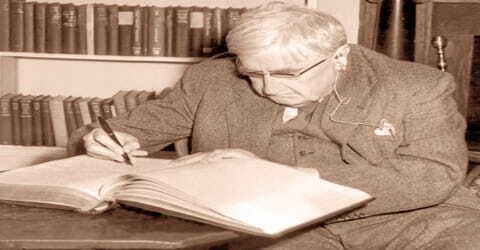 Ralph Vaughan Williams – English composer. 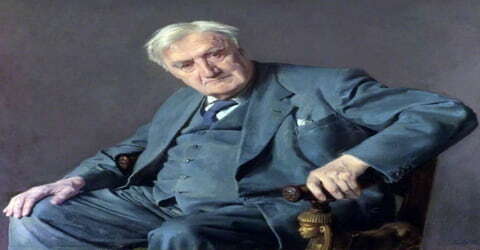 An English composer in the first half of the 20th century, founder of the nationalist movement in English music, Ralph Vaughan Williams was born on October 12, 1872 at Down Ampney, Gloucestershire, the third child and younger son of the vicar, the Reverend Arthur Vaughan Williams (1834-1875) and his wife, Margaret, née Wedgwood (1842-1937). His works include operas, ballets, chamber music, secular and religious vocal pieces and orchestral compositions including nine symphonies, written over sixty years. Strongly influenced by Tudor music and English folk-song, his output marked a decisive break in British music from its German-dominated style of the 19th century. Vaughan Williams was greatly influenced by the fascinating world of folk music and carols, which are quite evident in the “English Hymnal”, a work in which he was involved as a musical editor. Encouraged by this experience, Vaughan Williams incorporated this style into many of his compositions. He was not just a composer; he was a teacher, lecturer and was the earliest composers to collect folk music. Throughout his life, he mentored many young composers and conductors and had a proud array of students that included famous composers like Ina Boyle. His works were thought-provoking and high in quality. He encouraged everyone to make their own music and believed that it is far better to compose one’s own music however simple it is, rather than performing on another person’s music. Vaughan Williams is among the best-known British symphonists, noted for his very wide range of moods, from stormy and impassioned to tranquil, from mysterious to exuberant. Among the most familiar of his other concert works are Fantasia on a Theme by Thomas Tallis (1910) and The Lark Ascending (1914). His vocal works include hymns, folk-song arrangements, and large-scale choral pieces. He wrote eight works for stage performance between 1919 and 1951. Although none of his operas became popular repertoire pieces, his ballet Job: A Masque for Dancing (1930) was successful and has been frequently staged. Vaughan Williams always had a deep regard for all the traditional and classical works and believed that they can transport the listener to a completely different world. Read on to learn more about the life and career of this famous composer. 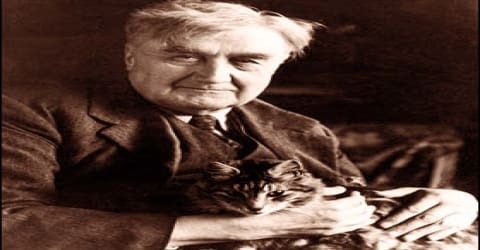 Ralph Vaughan Williams was born in Down, Gloucestershire, England, on 12 October 1872 to Reverend Arthur Vaughan Williams, a priest and Margaret Susan nee Wedgewood, who was the great-granddaughter of the famous English potter, Josiah Wedgewood, founder of the Wedgewood Company. The famous naturalist Charles Darwin was his great-uncle. His father died in 1975 when he was just three years old and his mother then took him to her family home at Leith Hill Palace. He was sent for piano classes but never liked it. His ultimate salvation lied in violin, his passion. In 1878, at the age of five, Vaughan Williams began receiving piano lessons from his aunt, Sophy Wedgwood. He displayed signs of musical talent early on, composing his first piece of music, a four-bar piano piece called “The Robin’s Nest”, in the same year. He did not greatly like the piano and was pleased to begin violin lessons the following year. In 1880, when he was eight, he took a correspondence course in music from Edinburgh University and passed the associated examinations. In September 1883 he went as a border to Field House preparatory school in Rottingdean on the south coast of England, forty miles from Wotton. His academic and sporting achievements there were satisfactory, and the school encouraged his musical development. In 1888 he organized a concert in the school hall, which included a performance of his G major Piano Trio (now lost) with the composer as a violinist. After completing his schooling from Charterhouse School, Vaughan Williams joined Trinity College at Cambridge opting for history and music as optional subjects. Famous philosophers G. E Moore and Bertrand Russell were his contemporaries and friends at Trinity College. During his time at Cambridge Vaughan Williams continued his weekly lessons with Parry, and studied composition with Charles Wood and organ with Alan Gray. He graduated as Bachelor of Music in 1894 and Bachelor of Arts the following year. After that, he attended the Royal College of Music (RCM), where he received training under the famous English composer Charles Villiers Stanford. There he also studied under Hubert Parry, who became a great friend. Leopold Stokowski, the famous British-born conductor, was his fellow student taking organ classes together under Walter Parrett. Gustav Holst was another friend of Vaughan Williams with whom he was actively engaged in constructive criticism of each other’s works, which helped them to progress in their areas of expertise. It was the company of such friends and teachers that helped Vaughan Williams to develop good composing skills. In October 1897 Ralph Vaughan Williams married Adeline Fisher, daughter of famous the historian Herbert William Fisher. They honeymooned for several months in Berlin, where he studied with Max Bruch. On their return, they settled in London, originally in Westminster and, from 1905, in Chelsea. There were no children of the marriage. She suffered from arthritis and died in 1951. Vaughan Williams maintained a secret affair with the poet Ursula Wood, who was already married to another person. Her husband died in 1942 and she volunteered to become the caretaker for Adeline, Vaughan’s first wife. In February 1953 Vaughan Williams and Ursula were married. The couple then moved to Hanover Terrace. It was the year of Queen Elizabeth II’s coronation; Vaughan Williams’s contribution was an arrangement of the Old Hundredth psalm tune, and a new set of “O taste and see” from Psalm 34, performed at the service in Westminster Abbey. The famous British Pianist Harriet Cohen was his lifelong friend. Both were very close to each other and Vaughan Williams often visited her house and also attended parties there. His work “Hymn Tune Prelude” was dedicated to Cohen, which she premiered in 1930. She also played the piece in many of her concerts. In 1933, Cohen premiered his “Piano Concerto in C major” and this work was also dedicated to her. Cohen played Vaughan William’s compositions in her concerts tours throughout Europe, USSR, and US. Ursula Woods wrote Vaughan’s biography, which was published in 1964. She remained the honorary president of the Ralph Vaughan Williams Society till her death in 2007. Ralph Vaughan Williams had a modest private income, which in his early career he supplemented with a variety of musical activities. Although the organ was not his preferred instrument, the only post he ever held for an annual salary was as a church organist and choirmaster. He held the position at St Barnabas, in the inner London district of South Lambeth, from 1895 to 1899 for a salary of £50 a year. He disliked the job, but working closely with a choir was a valuable experience for his later undertakings. ‘Linden Lea’ was Vaughan William’s first published work. He was engaged in other tasks as well like conducting, lecturing and editing music. He had learned to compose from the famous German composer and conductor, Max Bruch and the French composer, Maurice Ravel. Vaughan Williams had an inquisitive mind and throughout his life, he had an insatiable desire to learn more about music. About 1903 he began to collect folk songs, and in 1904-06 he was musical editor of The English Hymnal, for which he wrote his celebrated “Sine Nomine” (“For All the Saints”). After artillery service in World War I, he became a professor of composition at the Royal College of Music. 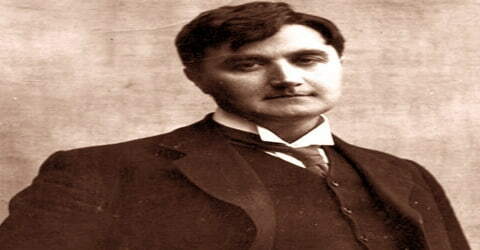 In 1903-1904 Vaughan Williams started collecting folk-songs. He had always been interested in them, and now followed the example of a recent generation of enthusiasts such as Cecil Sharp and Lucy Broadwood in going into the English countryside noting down and transcribing songs traditionally sung in various locations. Collections of the songs were published, preserving many that could otherwise have vanished as oral traditions died out. Vaughan Williams incorporated some into his own compositions, and more generally was influenced by their prevailing modal forms. This, together with his love of Tudor and Stuart music, helped shape his compositional style for the rest of his career. Over this period Vaughan Williams composed steadily, producing songs, choral music, chamber works, and orchestral pieces, gradually finding the beginnings of his mature style. His compositions included the tone poem In the Fen Country (1904) and the Norfolk Rhapsody No. 1 (1906). He remained unsatisfied with his technique as a composer. After unsuccessfully seeking lessons from Sir Edward Elgar, he contemplated studying with Vincent d’Indy in Paris. 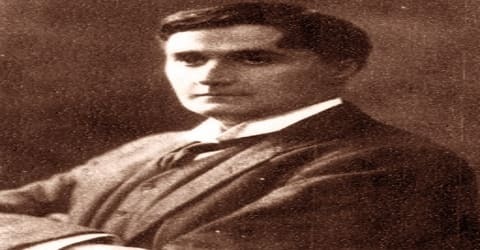 Instead, he was introduced by the critic and musicologist M. D. Calvocoressi to Maurice Ravel, a more modernist, less dogmatic musician than d’Indy. Vaughan Williams conducted his first concert in 1905, at the Leith Hill Music Festival, which he conducted continuously till 1953 and then passed the responsibility to his successor William Cole. In the year 1909, Vaughan Williams was proposed to compose incidental music for the Cambridge Greek Play, performed by the students and alumni of Cambridge University. The next year, in 1910, he conducted the premiers of “Fantasia on a Theme by Thomas Tallis” in string orchestra and also a choral symphony called “A Sea Symphony”, which became famous as his “Symphony No.1”. This was followed by “A London Symphony”, his “Symphony No.2”, which also enjoyed enormous success. This symphony was conducted by renowned English conductor Geoffrey Toye. In his Fantasia on a Theme of Thomas Tallis, composed in 1910, Vaughan Williams introduced antiphonal effects within the context of modal tonality, juxtaposing consonant, but unrelated, triads. Composed in 1914, his Symphony No. 2, “A London Symphony” brings to life, with great charm, the sounds of London from dawn to dusk. That year, Vaughan Williams also wrote his pastoral The Lark Ascending, for violin and orchestra. When World War I broke out, the 41-year-old composer enlisted as an orderly in the medical corps, becoming famous for organizing choral singing and other entertainment in the trenches. He was commissioned from the ranks, ending his war service as an artillery officer. The war interrupted the composer’s work but did not, it seems, disrupt the inner continuity of his creative development. In 1914 Vaughan Williams volunteered for military service on the outbreak of the First World War. Joining the Royal Army Medical Corps as a private, he drove ambulance wagons in France and later in Greece. Frogley writes of this period that Vaughan Williams was considerably older than most of his comrades, and “the back-breaking labor of dangerous night-time journeys through mud and rain must have been more than usually punishing”. The war left its emotional mark on Vaughan Williams, who lost many comrades and friends, including the young composer George Butterworth. In 1917 Vaughan Williams was commissioned as a lieutenant in the Royal Artillery, seeing action in France from March 1918. The continual noise of the guns damaged his hearing and led to deafness in his later years. After the armistice in 1918, he served as director of music for the British First Army until demobilized in February 1919. After the war ended, Vaughan Williams composed “Pastoral Symphony” (Symphony No.3) in which he used a mystical style. 1924 marked a new phase in his music career as he started adopting lively cross-rhythms and clashing harmonies in his compositions. His works like “Toccata Marziale”, “Old King Cole”, “Piano Concerto”, “Sancta Civitas”, “Job: A Masque for Dancing” belong to this period. Vaughan Williams wrote many songs of great beauty, including On Wenlock Edge (1909), set to poems of A.E. Housman and consisting of a cycle for tenor, string quartet, and piano (later arranged for tenor and orchestra) and Five Mystical Songs (1911), set to poems of George Herbert. Particularly notable among his choral works are the Mass in G Minor, the cantatas Toward the Unknown Region (1907) and Dona Nobis Pacem (1936; Grant Us Peace), and the oratorio Sancta Civitas (1926; The Holy City). He also wrote many part-songs, as well as hymn and folk song settings. In 1932 Vaughan Williams was elected president of the English Folk Dance and Song Society. From September to December of that year he was in the US as a visiting lecturer at Bryn Mawr College, Pennsylvania. The texts of his lectures were published under the title National Music in 1934; they sum up his artistic and social credo more fully than anything he had published previously and remained in print for most of the remainder of the century. Vaughan Williams composed his “Symphony No.4 in F minor”, which was composed in a style totally different from his earlier works. This symphony was first played by BBC Symphony Orchestra in 1935. In 1937, he recorded this work with the same orchestra, for ‘His Master’s Voice’ (HMV), which marked his only commercial recording. During this period, he also started giving lectures in America and England. He also gave private music tuitions in London and the famous Irish composer Ina Boyle was one of his pupils. However, the composer created a convincing musical description of a desolate world in his Symphony No. 7 “Sinfonia Antarctica” (1952), which was inspired by the request to write the music for the film Scott of the Antarctic. In addition to his symphonies, Vaughan Williams composed highly acclaimed religious music, as well as works inspired by English spiritual literature, culminating in his 1951 opera The Pilgrim’s Progress, based on the spiritual classic by John Bunyan. An artist of extraordinary creative energy, Vaughan Williams continued composing with undiminished powers until his death at 87. His seventh symphony “Sinfonia Antartica” was composed based on his music score for the film “Scott of the Antarctic”. His “Symphony No.8” was first premiered in 1956 and his “Symphony No.9” was his last symphony, which premiered in 1958. Ralph Vaughan Williams refused a knighthood at least once and declined the post of Master of the King’s Music after Elgar’s death. The one state honor he accepted was the Order of Merit in 1935, which confers no prenominal title: he preferred to remain “Dr. Vaughan Williams”. In 1935, in the Queen’s Birthday Honors, he was recognized with the Order of Merit, a dynastic order meant to recognize distinguished service. His academic and musical honours included an honorary doctorate of music from the University of Oxford (1919); the Cobbett Medal for services to chamber music (1930); the gold medal of the Royal Philharmonic Society (1930); the Collard life fellowship of the Worshipful Company of Musicians (1934, in succession to Elgar); an honorary fellowship of Trinity College, Cambridge (1935); the Shakespeare prize of the University of Hamburg (1937); the Albert medal of the Royal Society of Arts (1955); and the Howland memorial prize of Yale University (1954). Vaughan Williams was elected President of the “City of Bath Bach Choir” in 1946 and continued in this position till 1959. 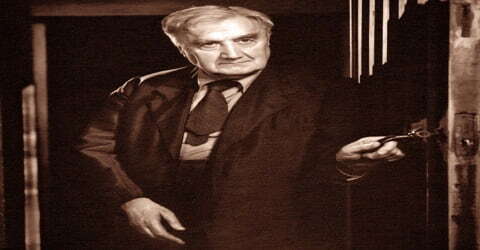 He was elected President of the English Folk Dance and Song Society in recognition of his efforts to preserve folk music the Society’s library was renamed “Vaughan Williams Memorial Library”. Ralph Vaughan Williams died suddenly in the early hours of 26 August 1958 at Hanover Terrace, aged 85. Two days later, after a private funeral at Golders Green, he was cremated. On 19 September, at a crowded memorial service, his ashes were interred near the burial plots of Purcell and Stanford in the north choir aisle of Westminster Abbey. Vaughan Williams leaves behind a strong legacy and much of his works were recorded by many musicians, after his death. Early recordings of his symphonies were done by Henry Wood, John Barbirolli, Adrian Boult, and Leopold Stokowski. “A London Symphony” was recorded by Sir Eugene Goossens. Dimitri Mitropoulos and Leonard Bernstein recorded the “Fourth Symphony”. Paavo Berglund recorded both the “Fourth Symphony” and the “Sixth Symphony”. Recently, Somm Recordings released the first official recording of his “Fifth Symphony”, conducted by Vaughan Williams in 1952. EMI Classica had released a CD set of 30 CDs, which has all of this great composer’s works with alternative stings. Vaughan Williams, like most leading British 20th-century composers, was not drawn to the solo piano and wrote little for it. From his mature years, there survive for standard chamber groupings two string quartets (1908–1909, revised 1921; and 1943–1944), a “phantasy” string quintet (1912), and a sonata for violin and piano (1954). The first quartet was written soon after Vaughan Williams’s studies in Paris with Ravel, whose influence is strongly evident. In 2002 the magazine Gramophone described the second quarter as a masterpiece that should be, but is not, part of the international chamber repertory. It is from the same period as the Sixth Symphony and has something of that work’s severity and anguish. The quintet (1912) was written two years after the success of the Tallis Fantasia, with which it has elements in common, both in terms of instrumental layout and the mood of rapt contemplation. The violin sonata has made little impact.